NOTE: This trial was terminated in 2014 because oak root fungus, which was present in the previous pear planting, killed or severely stunted most trees. To see photos and seasonal progress of the trial, click on the links on the left. Cherries have historically been grown as large, open-center trees, but with dwarfing rootstocks, newer training systems have been developed and are in use in the Pacific Northwest. 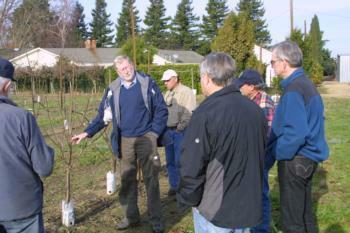 Lynn Long (OSU) discusses KGB pruning at the site. From right to left: Greg Lang (MSU), Jeff McCormack, Joe Grant, Robert Arceo, & Malcolm McCormack. This trial is being conducted by Joe Grant (UCCE San Joaquin County) and Chuck Ingels (UCCE Sacramento County), and is part of a North-Central Regional Research Project (NC-140), led by Dr. Greg Lang of Michigan State Univ. The trial location is Robert Arceo's home ranch on River Road about halfway between Courtland and Walnut Grove. Trees were planted in March 2010, using the variety Benton. Spacing between trees is 5 ft. and row spacing is 16 ft. (consistent with the rest of the orchard). A trellis was installed, with 4 wires spaced 2 ft. apart and the top wire at 10 ft. above ground. Click on the links at the left to see photos and seasonal progress of the training systems, starting at planting. Three rootstocks are used in each training system: Gisela 3, Gisela 5, and Gisela 6. In addition, Gisela 12 was planted in the UFO system only. Four trees were planted for each of the nine rootstock/training systems, and six replications were used, for a total of 216 treess, plus the 24 Gisela 12 trees.